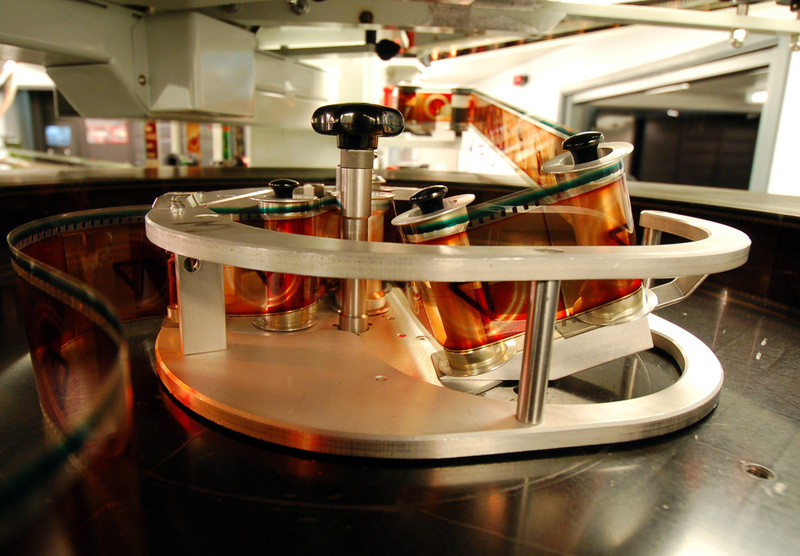 Pair of IMAX 70mm 3D projectors in 2006 and the QTRU - Quick Turn Reel Units "Non-rewind" to the left, developed by Kinoton around 1996. Picture by Thomas Hauerslev. 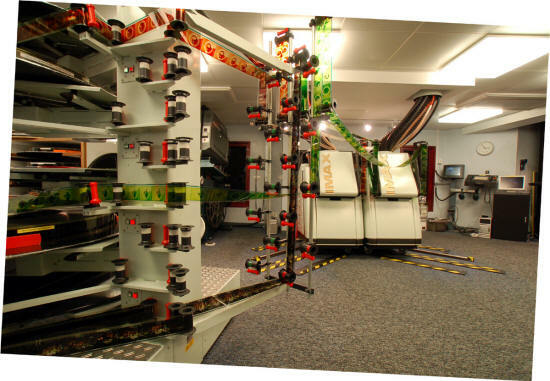 When IMAX opened at the NMeM in 1983, a little over 10 years after the IMAX technology premiered in Japan, it was the first ever IMAX Cinema in Europe and contained Britain’s largest cinema screen – it had to be lowered into the auditorium through the roof, as there was no other way to install it. 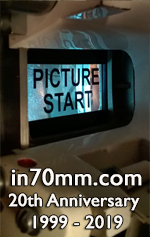 IMAX 70mm film. Picture by Thomas Hauerslev. The first feature length film ever to be filmed in the IMAX format was the Rolling Stones 1990 Steel Wheels concert. When the Stones were performing in Manchester, Mick Jagger, Ronnie Wood and other members of band and crew drove to Bradford after their performance to watch several rushes on the Museums IMAX screen, so they could feedback on how they thought the filming of their tour was going. They asked the Museum to keep their appearance private and this was duly honoured, so around midnight they were able to see themselves up real close on Bradford’s giant IMAX screen. Ronnie Wood later attended the UK premiere here in Bradford. With a newly refurbished IMAX sound system and huge air-filled figures of women and a wolf, as featured on stage in the concert, set up in front of the museum, it was a night to never forget. The museum also hosted some astronauts to coincide with the opening of one of NASA’s IMAX space films. Cosmonauts visited the Museum to answer questions from school groups who were keen to learn more about their experiences in space. 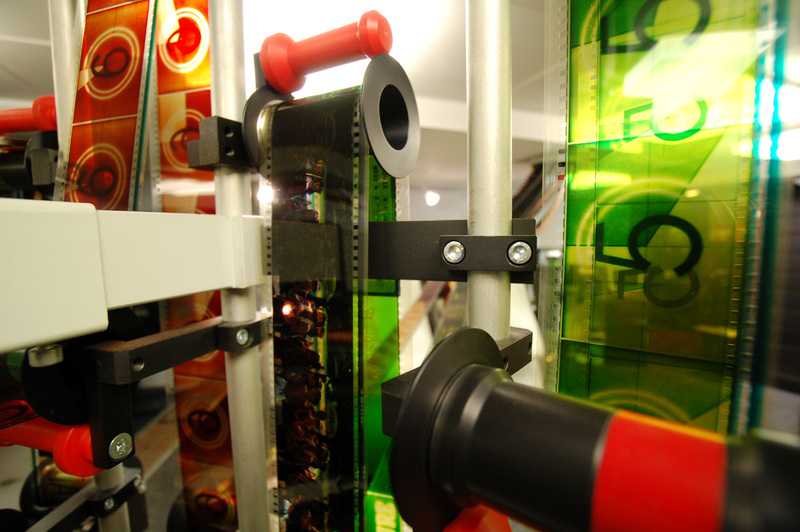 One of the original co-founders of the IMAX system, the Canadian Graeme Ferguson, visited Bradford several times. He received an honorary doctorate from the University of Bradford in 1994, and performed a live Q&A discussing his career and why he chose to invest in the IMAX. Ferguson’s name still appears on the IMAX screen on a daily basis, as executive producer of Hubble 3D, one of our current popular school screenings. Pair of IMAX 70mm 3D projectors in 2006 and the QTRU to the left. Picture by Thomas Hauerslev. When, in 1994, the IMAX Company started to see a growth potential in Hollywood content, and was able to use the Digital Re-Mastering (DMR) technology to turn existing films into IMAX hits, it decided to go public with this new format. Now, only twenty years later, there are more than 837 IMAX theatres across 57 countries, screening the latest blockbusters from Christopher Nolan, James Cameron or J.J. Abrams. 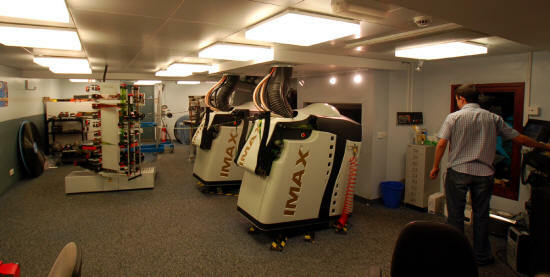 IMAX is an experience so all-inclusive that the audience becomes part of the on-screen action. So make sure you pay a visit to Bradford’s refurbished IMAX cinema when it reopens in September, to climb Mount Everest with Jake Gyllenhaal, fight SPECTRE with Daniel Craig or travel to a galaxy far, far away.